Driving a truck for a living can mean long stretches away from home and the uncertainty of finding work. 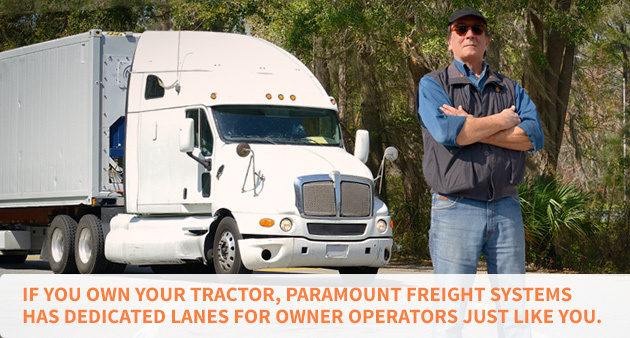 But if you own your tractor, Paramount Freight Systems has dedicated lanes for owner operators just like you. Stability – Drive a scheduled route from terminal to terminal. No fighting for hauls or waiting for freight to be loaded or unloaded. Our dedicated lanes customers expect superior service, and we make every effort to operate in an efficient manner. Enjoy quality time at home on a regular basis. Family is important to PFS. Steady Income – PFS drivers earn a regular income from dedicated runs. Get paid for every mile you drive whether you’re loaded or empty. We pay drivers a fuel surcharge to help control fuel costs. Regular Routes – Have the peace of mind that you operate on a regular route, thus lessening the chance of surprises. Get to know your customers and build stronger business relationships. Fringe Benefits – New owner operator drivers receive a sign-on bonus, tag and permit services, and discounts on fuel, parts, and tires. PFS accepts online applications for dedicated lanes owner operators. To qualify, you must own a tandem-axle or single-axle day cab/sleeper tractor that is not more than 10 years old; you must have a Class-A CDL with HazMat and Doubles endorsements; at least one-year verifiable experience driving tractor trailers within the last three years; and no preventable accidents within the last three years. Check out PFS and see how we can get you on the road and on your way to success. Contact us today.